For 47 years, “DAC is everything” has been a way of life for Pat Pistilli. For at least one evening in October, however, DAC was more than just “everything”. It was also family, champagne, memories, strength, honor, a job well done, and – by the way – the 2010 Phil Kaufman Award, presented this year to Pat Pistilli – and of course, by inference, to his bride of 57 years, Marie Pistilli – for the 1964 founding of the Design Automation Conference, and 40+ years of inspired leadership of that legendary go-to place for all things EDA. First, I wanted to know what Pat would say during his acceptance speech at the EDAC/CEDA-sponsored Kaufman Dinner on October 12th. Pat was working on that exact issue: “Just before you called, I was looking at the talk I gave at the very first DAC. I'll probably start with that,” Pat said. “In that talk, I attempted to cover all of what had been accomplished to date in design automation, to look at what point we had reached in the journey to man-machine systems. I said, in the electronics industry we were approaching a workable automation. In logic circuity, we had used a computer for wire routing, testing and automatic manufacturing, and increased the efficiency. At best, however, a design automation system was still only a partial system. “I said we needed to ask about the problems of automating the initial design itself. What has been done, I asked, using the computer to automate the specifications themselves? At that first DAC, I said it was time for all of us to share our problems, our needs, our plans, and our aspirations. And that was how I felt about things in 1964. “Most of it didn't come along until later in the 60s, however, because up to that point design automation was all about defined parameters and solving specific problems. At Bell Labs, for instance [where Pat worked for over 29 years, we were designing an anti-missile system with well-defined parameters. From 1960 to '63, IBM was also working on a specific problem – they were designing their new 1401 computer, a transistorized machine they put it out in early 1964, the same year as the first DAC. The 1401 represented man-machine interaction even before physical design. Admirable, I said, but I wanted Pat to go on with his story about DAC – a story he knows better than anyone, except for his splendid help mate, Marie. Pat said, “Well, from the beginning, Marie and I took our 'not-much' money out of our savings account to fund the entire conference. And from the beginning, Marie was very supportive, even though it meant a lot of extra travel for me. She always worked with me on the conference, and by the way, also from the very beginning, we had a woman's program as part of the conference. Marie insisted. “At one of the earliest DACs, Marie gave a talk to the wives of the men attending the conference. She said, 'Know your husband's job!' She was very positive that every DAC had to include talks, given in layman's terms, so the wives would understand not only what their husbands were doing, but also why their work was so demanding that they were rarely home. When I give my talk at the Kaufman Award dinner in October, I will start by thanking Marie for that,” Pat said. Still thinking out loud, Pat said: “I'm thinking of titling my talk, 'A Funny Thing Happened on the Way to the Kaufman Award', and then listing some of the highlights of the last 48 years of DAC. That would probably be more interesting than how I developed the first CAD system at Bell Labs. Really, most people in the room wouldn't even blink an eye at a story about my work at Bell – even though at the time, that's all we had. I'm talking about way back in 1959, when all we had was a 704 IBM computer, a 32k machine with vacuum tubes, and no storage whatsoever! “It was such a challenge, that when I first got pushed into it by management – because we were having problems solving a major design challenge – I didn't know a thing about computers or programming. I only knew I could design a register circuit. And when I got into CAD at that point, the only language available was FORTRAN. “Of course, 10 or 15 years later, we were using IBM 360s and PL1s, and the languages were more conducive to the type of work we were doing, but FORTRAN was not conducive at all! I had to learn all of that, plus the efficiency of using it. It was nice that it compiled way down, would shrink down to a usable amount of data, but it was very difficult to learn all of this at the time, and all at once. “I always tell people – You learn by doing! You start at something, you get it partially done, and then you change it because you've learned how to do it better. While Pat Pistilli was in a reflective mood, I asked him what he would change if he could turn the clock back to 1964. He echoed back: “What would I change? 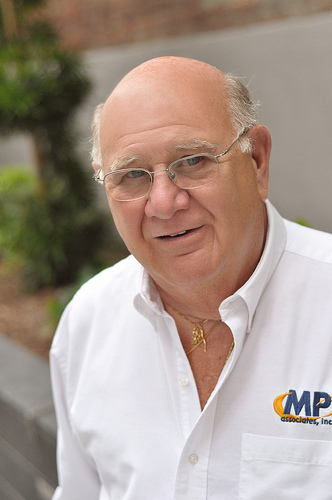 Pat went on: “When we finally started MP Associates, the real driving force was Marie. After all, I had an excellent position, with a good salary and lots of responsibility. At the time, Bell Labs was the premier research company in the world. But then at some point as the conference was growing, Marie and I were putting out RFQs to run DAC, and she talked me into doing it ourselves. “I had been married to Marie for a long time at that point, but hadn't realized until then how strong she really was – it was something I learned about my wife at that point. That, and the fact that she really knew how to manage people. “After we started MP Associates and took over the conference, it was Marie who succeeded in driving the number of exhibitors to up over 200 companies at one point. It was Marie who came up with the idea of suites on the exhibition floor – and she was always looking out for the small companies and [lesser known] people at DAC. “I just didn't have the personality for that type of work. Quite honestly, I get angry too easily. But Marie was different. She was very quiet about herself, and I was really shocked. She had quite a background in business and put those skills to work building the conference. Plus, her manner with people were just fantastic. She's absolutely always kept me on the straight and narrow. She was always saying, 'Now look, Pat. You just can't be like that with people!' – and she's been doing that for years. “That used to bother her a lot. Even at the first DAC Executive Committee meeting – I was there – Marie was the only female in the room with all these guys. At first she was somewhat intimidated, but within a year she had those guys under her thumb. “She always said, if it was detrimental to the exhibitors, it was going to be a big problem. A lot of the guys were purists. They didn't even want exhibits, and just considered them a big thorn in their side. But Marie fought for the exhibitors gracefully, and without making enemies. “And, she was the single most instrumental person making sure that the female element was represented in organizing DAC. She always insisted that we put a female on the Executive Committee. Then, when we came up with the new direction for DAC, Marie made sure there would be a program for women. Pat laughed and said, “You know, when I first left BTL to start MP Associates, my colleagues had a $50 pool that working together we wouldn't say married. But, I'll tell you – only 3 months into MP Associates, Marie sat down and said to me, 'Look, Pat. I have my responsibilities and you have yours. When I need guidance, I'll ask you, and vice versa for you. But, don't come over to my half of the company and tell my people what to do. His own path secure, I asked Pat about the future of DAC and EDA. He was quick to respond: “I really believe academia and industry both need to be represented at the conference. That's where the future of DAC should be. “For the industry – it's always been the case that the tool users will make you or break you. EDA companies sell their tools to customer companies, but upper management at those customers often haven't a clue of what they're buying. If the message comes up to them from the users down in the company that the tools are no good, the EDA company is out. “So, it's the lowest man on the totem pole in the customer’s company that's going to hurt you the most, if you don't have him on your side. When you're developing CAD software, you have to keep that in mind. “Also, we all know that we design something once, but we build it thousands of times. It's the manufacturing of the design that's the most important, so if tool developers can do something within the design system to make the manufacturing easier and more efficient, they need to do it – even if it costs a little bit more in developing the software. And that, more than anything else, is why Pat Pistilli deserves the 2010 Kaufman Award. He's a man with a vision, who's got his feet planted squarely at the interface between design and reality.